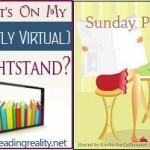 What’s on my (mostly virtual) nightstand 11-20-11 – Escape Reality, Read Fiction! Thanksgiving is this Thursday. We’re driving to my mom’s in Cincinnati on Wednesday. I’ll either get a lot read this weekend, or not much. Also, since it’s an 8-ish hour drive from Atlanta, we need to pick something to listen to while Audible is still having their sale. But somehow this week I still need to get stuff read for reviews. Next Monday will come all too soon. But this Wednesday will come even sooner! The first thing on my “to be read” list for this week is for this Wednesday. Theft of Swords by Michael J. Sullivan is due out on Wednesday, November 23, and so is my review. Theft of Swords is the first book in Sullivan’s Riyria Revelations, and is a re-release of the first two books (The Crown Conspiracy, Avempartha) of his series in a single volume. I also have the second volume of the re-release, Rise of Empire, and I’ll be reviewing that in December. I’ve seen a lot of good reviews of the original release of the Riyria Revelations, so I’m looking forward to this. I really hope that the third volume, Heir of Novron, goes up on NetGalley soon, otherwise I’m going to end up buying it just to find out how everything turns out. If Theft of Swords looks like a traditional epic fantasy, my second book is a different kind of fantasy entirely. Her Christmas Pleasure by Karen Erickson is a romantic fantasy of the historic, hot and steamy variety. This book is short, but probably more spicy than sweet. I have a soft spot in my heart for this author, as one of her other books, Lessons in Indiscretion, was the first title I reviewed for NetGalley. Two other historic romances are part of my week’s reading; A Midsummer Night’s Sin by Kasey Michaels, and Desired by Nicola Cornick. Both books are part of series, and I have read and reviewed previous titles in each series. Nicola Cornick’s Desired is part of her Scandalous Women of the Ton series. I reviewed Notorious this summer. And I also reviewed The Taming of the Rake, the previous entry to Kasey Michaels Blackthorn Brothers‘ series, on the very same day. The final book in the Royal House of Shadows series is due out next week. Nalini Singh’s Lord of the Abyss is on my list. I’m looking forward to seeing how this series finishes out. I’ve seen a few ARC reviews for this book, but I’ve tried to avert my eyes. I don’t want to judge the book before I read it. And last, but not least, one of those things that makes me glad I go through this exercise a week in advance, even when it causes a major “eek” moment. 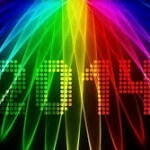 I have Tricks of the Trade by Laura Anne Gilman on my list. I loved her Retrievers series, so I thought I would also like her Paranormal Scene Investigators series too. Tricks is the third book in the series, and I figured that by picking up book 3 from NetGalley, I would finally read books 1 and 2, Hard Magic and Pack of Lies, which I have in print. So now I have to read those first before I start Tricks of the Trade. They’ll be something to read in the car if the iPad runs out of juice (not that we don’t have two Apple device car chargers, but it’s always good to be prepared!) Hard Magic and Pack of Lies are also the only two books for next week that are not from NetGalley. Not only do I own those, they are print copies I moved from Florida to Georgia. It’s high time they got read! Looking back at last week’s post, I didn’t do half bad. A had some help from a couple of sleepless nights, and my husband spent way too much time working, but hey, it all counts, right? I got everything read for this week, almost. I still have about 2/3rds of Edge of Survival to go, but it’s really good so far. I still need to read Fallen Embers and Burning Embers for Lauri. And that library book, I just bought the thing from Amazon. Since the local library doesn’t even own Charles Todd’s Wings of Fire, I either needed to finish or spend another $2 to borrow it again from some other library. The Kindle version was only $7.99. I did the math, factored in the worry, and gave in. I have a lot of writing to do to get all these books out of my head. At least the reviews for Frost Moon and Blood Rock are out of my head. Those books were absolutely awesome. 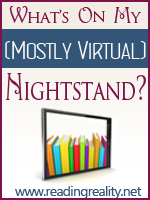 Just a reminder, Ebook Review Central tomorrow will be the Carina Press titles from October. And tune in next week for another exciting edition of “As the iPad turns”! I am exhausted just reading your list. I have read The Crown Conspiracy and have all the others on my NOOK. I liked the first but the rest just keep getting pushed back. I will be watching for your review. Maybe that will push me to finish the series. I started Theft of Swords at lunch today. So far, so good. The only problem I see with them having combined the two books into one for the new publication is that it’s 500 pages. Ouchie, ouchie. I don’t think I’ll be reviewing it tomorrow. Next week suddenly looks a LOT more likely.